On Saturday, April 30th, there will be a sailing adventure at the northeast side of Ilhabela designed to please the LADC2011 attendees as a day out from the conference. Ilhabela, an amazingly small island, with just over 25,000 inhabitants, in the north coast of São Paulo, is located at 100 km from São José dos Campos. It comprises an area of 348 sq Km surrounded by 39 beaches and over 300 waterfalls. This environment engulfs visitors into a green charming tropical forest on the Atlantic cost. 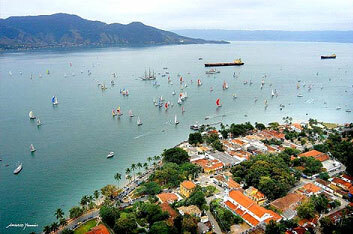 Ilhabela is named the Capital of sailing and cruising in São Paulo State. For the last ten years, several cruise lines have anchored on the island to visit the small village. This summer season has been the longest of its history. It has began in October 2010 and will most likely remain as such, up to April 2011. • A van or a bus will pick up the group at the conference hotels on Saturday at around 7:30 am. • One hour-trip down through the Atlantic Mountain Chain will take the group to the São Sebastião harbor. • A ferry boat links the harbor to the Perequê pier at the island where a schooner will be waiting for the group. 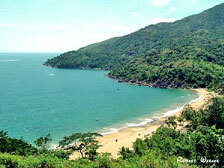 Fome beach – The Sea is greenish-blue, with calm waters and good for diving. With 150 meters of extension, the beach is accessible by trail or sea. It is crossed by two streams. This beach is known in the region for an old historical house used to keep slaves in colonial times. The name "Beach of Hunger" comes from the story that slaves were fed, after a long journey from Africa. They were kept there in order to gain weight to be sold for better price. 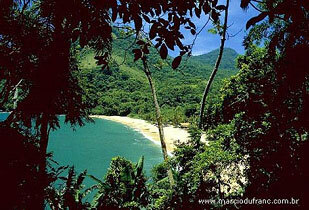 Jabaquara beach – Jabaquara is one of the most beautiful secluded beaches on the island. It is about 500m long, with a strip of white sand, cut by two freshwater streams. The right side river empties its water into a beautiful lake. It is the last beach in the north where access by car is possible. Two bars serve drinks and fish dishes to visitors. • A ferry boat will take the group back to São Sebastião harbor. • The return will last one hour through the Atlantic Mountain Chain by private bus that will bring the group back to São José dos Campos in the evening sometime. • Transportation done by van to/from São José dos Campos/Ilha Bela. Local Restaurants with good structure are available at Jabaquara beach, restrooms and bottled water. 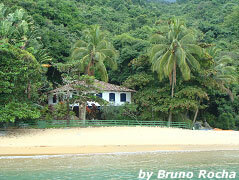 Option 2: A daily stay, without lunch, in the Ilha Flat Hotelcosts R$ 150,00 per person. The Hotel is located in a prime area at the Perequê beach, 3 km away from the ferry and 5 km way from the historical center. At this point, you'll be a few minutes way from excellent beaches, bars, restaurants, shops and all the best of Ilhabela. • Hotel recreation area (swimming pool, sauna etc.) and entertainment. Restaurant service is available at the hotel. • Hotel recreation area (swimming pool, sauna…) and entertainment. • Full course buffet lunch with dessert. • Drinks: 2 caipirinhas, 2 beers, soft drinks or juices 2 per person.